Say you run your application on a 15’’ laptop with resolution set to 3480×2160 and scaling set to 250% (240 DPI) – the ideal glyph size for this is 40×40 pixels as 250% of 16 is 40. Do you have all the images/bitmaps you use in your application in 40×40 px size? Do you have them in 20×20 (125%) and 24×24 (150%) and 32×32 (200%) and 48×48 (300%) and so on .. ? I surely do not. I’ve started developing this particular application of mine some 10+ years ago. At that time I’ve used bitmaps shipped with Delphi and those are 16 x 16 pixels (actually 32×16 as the image has the mask in it). I’ve used those for menus, toolbars, buttons and all around my UI. I’m no graphics guru – have no plans (read: time) to redraw all those glyphs to have them in various pixel perfect sizes. I guess most of you are in the same position. Now, and again, ideally you would want to display pixel perfect 40×40 bitmap when on 250% DPI. When I say pixel perfect I mean you would want to have a glyph that is not upsized or downsized by resizing – as stretching a bitmap will suffer from aliasing effect. If you have your glyphs in all needed sizes you can accomplish this by storing all the images you use in your UI directly inside your executable as a resource, then depending on the DPI scaling load the needed size and apply to UI. For me, the whole “my icons/glyphs/images appear small“ issue boils down to resizing the bitmaps in image lists (TImageList) and those set for the Glyph property for TBitBtn and TSpeedButton. So, without further ado, here’s what I did with TImageList components: I’m upsizing images to fit the needed size depending on the logical DPI. The thing is that, yes, aliasing will happen, and your 16×16 px bitmaps when stretched to 40×40 would not look their best. But on 15 inch 4K display when on 250% DPI – 40 pixels look (“eye testing”) as small/big as 16 pixels on 24 inch Full HD 100% DPI (96). What I’m doing here: I’m copying all images from a 16×16 image list to the highDPIImageListContainer. The Size (actually Width/Height) property of the original image list is set to match the needed size per the logical DPI setting (note: SetSize clears the image list). Finally, resizing (/upsizing) or centering all the images and adding them back to the original image list. That’s it, no magic here. As I said, not ideal, but works for me. The final result is in the image on top. The left side is when images are displayed as 16×16 and the right side is when they are upsized to 40×40 (250% logical DPI). Also, images in the previous post display how this looks in a sample application. Now, the glyphs in menu items look ok – they are not too small. Not too sharp either, but usable. However, when you move your mouse over menu items you’ll notice that images would disappear. That’s actually Delphi not handling menu drawing how it should be done. Nothing to do here, except wait for Embarcadero to fix. Here goes: Making the Glyph Property High DPI Aware for TBitBtn and TSpeedButton. Why are you stretching each individual ImageList image separately? That can be pretty slow. Are you aware that TImageList stores all its images in two large bitmaps (one for images and one for image masks) and that you can access these bitmaps by getting their handles using GetImageBitmap and GetMaskBitmap methods. 2. Copy contents of ImageList ImageBitmap to previously created bitmap for storing ImageBitmap copy. You can access the ImageList ImageBitmap by getting its handle with GetImageBitmap method. 3. Do same for ImageList MaskBitmap. 5. Resize the ImageList ImageBitmap to fit the stretched images and StretchDraw the contents from ImageBitmap copy that you make previously. This approach would allow you to resize all ImageList images at once and would thus be much faster than your approach. But it can’t be used for when you are just centering (repositioning) images. BTW: When copying all images from one image list to another why don’t you use AddImages method instead of calling AddImage multiple times in a loop? I’m not sure about your GetImageBitmap/GetMaskBitmap idea. In step 6, how do you assign the stretched image back to the image list (there’s no SetImageBitmap or alike I know of)? I’m not using AddImages as this will copy images in their original size and not stretched / centered. But for some reason it’s not working for me. I have 36X36 images, but after running the stretch or centre, I’m just getting a few weird pale shapes. It almost looks as if the mask and image are getting placed into one squashed image as the left hand side has some pale ghostly shapes, and the right hand side nothing. After a lot of fiddling around (eventually ran at 96 DPI design time and run time, just copying the list out and back again) the best I could get was the top left half of the logo showing. 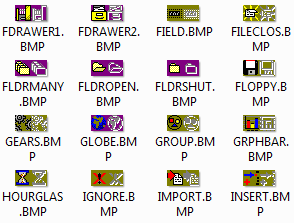 Not sure what is different on my bitmaps to yours (can’t see anywhere I could upload my TImageList?) Or a sample pic. Sorry about not being able to provide you with anything concrete, but any ideas? Just debugging is a nightmare, as you can’t see which if the 3 stages are losing the images. Yes, thanks, I was creating the highDPIImageListContainer at runtime. Not sure what size it was defaulting to, but it made everything go haywire. Came right when I set it to the same size as the image list I was trying to resize. Obvious when you spot it, but had me scratching my head for a bit! Maybe just make a note to make sure the size of the HighDPIImageListContainer matches the original size of the imgList (or call SetSize() in your code) else really strange things happen to your images.